Folic acid (Vitamin B9) helps prevent neural tube defects (NTDs) which is a serious birth defect of the spinal cord (Spina bifida) and the brain (Anencephaly). The neural tube is the part of the embryo from which your baby's spine and brain develop. Neural tube defects occur at a very early stage of development before many women even know they're pregnant, which is why it's important to begin taking folic acid before you start trying to conceive. The Center for Disease Control and Prevention (CDC) reports that women who take the recommended daily dose of folic acid starting at least one month before conception and during the first trimester of pregnancy reduce their baby's risk of neural tube defects by up to 70 percent. 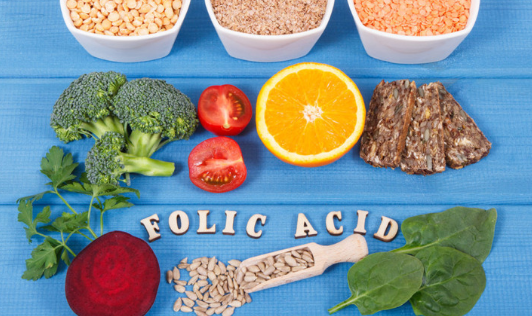 What else does folic acid do for you? Your body needs this nutrient to make normal red blood cells and prevent folate related anemia. It is also essential for the production, repair, and functioning of DNA. Getting enough folic acid is particularly important for the rapid cell growth of the placenta and your developing baby. To reduce your baby's risk of developing a neural tube defect, experts recommend that you should take 400 micrograms (mcg) of folic acid a day, beginning at least a month before you start trying to get pregnant. Don't take more than 1,000 mcg per day of folic acid unless your healthcare provider advises you to. This is particularly important if you are a vegan. Vegans are at risk of being deficient in vitamin B12 and taking too much folic acid would make it hard to diagnose that deficiency. Foods that are naturally rich in folate are not a great source. Research shows that the body absorbs folic acid from supplements much better than the folate that occurs naturally in certain foods. Furthermore, folate can be lost from foods during storage or destroyed by cooking.